I bought this to read because Evelyn Waugh was one of the main subjects. It covers the period after the First World War where there was a fashion, particularly among Oxford types to be very, effeminate or be dandy's. This is explained as a rebellion against the stiff upper lip of their fathers and the world that had lead them into the Great War. 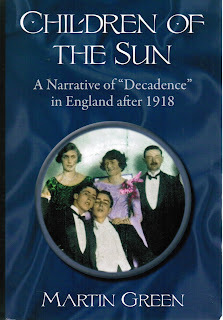 The focus of the book is on Harold Acton and Brian Howard firstly,but as these two never really achieved alot in comparison to others like Waugh, Auden and Isherwood et al it looses its way often. I would be reading along ready to put it back on the shelf and then there would be some little gem concerning Waugh or pre- WWII history-this would be enough to keep me going until the next tedious part ,and there are a few,and then something else would make it all worth while. There is some very good background on Philby, McLean and Burgess as these three were all part of this generation. Still amazing the Oxbridge types did nothing even though they knew Philby was a spy. Many lives could have been saved if someone had acted. This is a good socail history and great for dipping into but the authors thesis that this dandisim was a dominant cultural style in Britain for a period is unproven, in that he is talking of a very small proportion of Oxbridge undergraduates and graduates let alone the entire population of Great Britan.